210-52nd St. (Unit North), Sea Isle City, NJ - Farina & Boeshe Real Estate Co.
FIRST YEAR RENTING - This home has it all! 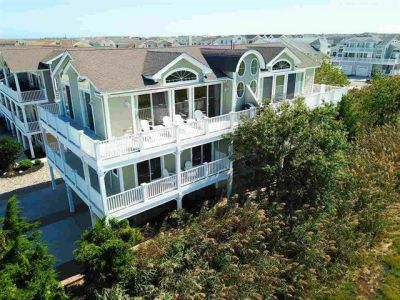 If you enjoy nature, relaxation, & breathtaking water views then this rental is for you.Enjoy stunning sunsets with unobstructed bay views from the deck, living room, dining room and two master bedroom suites. Also features an ocean view from the second floor deck. High-end interior finishes include hardwood floors, granite counter tops, & upscale kitchen & bathrooms.Relax & unwind in luxury as you spend time on a quiet serene area of the island. Short walk to beach, library, Fish Alley, restaurants, playground, and shopping. With four bedrooms & a bonus room you can sleep 12. Master suite 1 offers top floor view, queen bed, double sink & full tub with shower. Master suite 2 features king bed, double sink & large tile shower. Second master is spacious enough for a pack & play or an inflatable mattress. Both masters face the bay.The third bedroom has a queen bed & fourth bedroom has pyramid bunk with single trundle underneath.This kid friendly room features Xbox one complete with games. Bonus room has sofa & sleeper sofa. 32 inch flat screen TV's in each bedroom and larger flat screen in living room and bonus room.Roku streaming capabilities to access your Netflix Amazon prime Hulu or Vudu accounts. Living room streaming through Blu Ray player. High speed internet & cable, gas grills, new deck furniture & fully equipped kitchen with Kuerig. Garage for storage, beach chairs, umbrella & beach toys.Private fenced back yard with outside shower. Off street parking for two plus off-street parking.